Cannon Beach in Oregon is the most famous and popular stretch of coastline known to Portland tourists. The dominant Haystack Rock is a 235-foot (71m) steep formation that is reachable on foot when the tide is low. William Clark of the Lewis and Clark Expedition first set foot on the sand in 1805. The same nine miles (14.5km) of beach, beautiful hiking trails, and tidal pools filled with sea life are there for new explorers to discover. A tourist-focused beach town gives present day travellers quaint hotels, cottages, and restaurants. 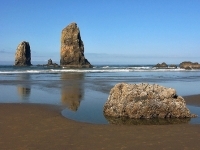 Cannon Beach hosts a number of popular events in the summer, including a sandcastle building competition in June. The town's Fourth of July celebrations are also festive, including a parade and military flyover. Visiting the area during the events requires forward planning as accommodation is generally booked far in advance.